Ok pics first and I'll gab about it later. The project now looks like this and this is essentially the finished SR-1. This is the base SR-1 anodized, and the three anodizing options. This is the pricing information as we have it now and it is entirely subject to change. As my current understanding, 3 shells are included. Extras may be available, I have no known price at this time. For price plus anodizing you take $450 and add cost below, plus shipping. As far as I know this was a projected price subject to change. As far as I know there are none available for sale to the general public at this time, as this still in prototype stage. CCM will tell us all when they are up for sale and what the final confirmed pricing format is. Ok, just got the anodizing break down. Black hard ano as machined (type3) no charge. as machined = no polishing. The gun will be deburred and surface finish will be scotch brighted.You will see machine marks. Dust black will hide most small machine marks. The surface finish was machined to resemble mil-spec guns and does not impede preformance. This is a Bolt Action Cartridge Fed Rifle. 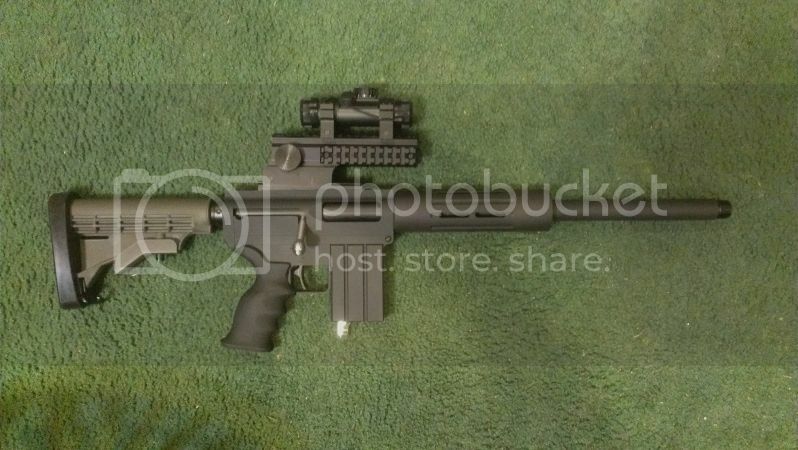 This gun is designed as a First Strike Platform primarily, but will shoot Paintballs. You will not see any performance gains while shooting .68 caliber paintballs, it will perform in all aspects like a paintball gun. No it is not mag fed. This model will not be mag fed. No it is not constant air, but you can remote line it. Both are in the magazine. It is cartridge fed, meaning a cartridge holds the round you feed into the gun, one at a time. You have the option to lock the cartridge in the breech and fed in rounds, one at a time. The cartridge works as a barrel sizer. The gun is manually operated bolt ejecting. It comes in either left or right hand models. It takes all real steel AR-15 furniture. Free floating furniture works best, but will take 2 piece hand guards, you will need a delta ring and a front gas block as well as a front cover. You will have to provide them. The barrel is 1" outer diameter. The barrel tip is thread to accept 7/8 20 TPi threaded tips. Lapco and Custom Products Combat tactical barrel tips will work with this threading. The gun includes a top picatinny rail and is tapped every inch along the top behind the cartridge lock in screw. The gun weighs 3.5lbs without any furniture or grips. If I have missed anything please fill in and I will edit the thread. Last edited by shadawg; 07-24-2012 at 07:02 PM. Last edited by shadawg; 11-30-2012 at 01:34 PM. Thanks for pulling this all together shadawg! I've been wanting to do it myself but it would take me a month using Tapatalk. Last edited by Crimson Death; 07-21-2012 at 12:52 AM. No sweat, I added some info I have from my talks with Bill about this platform. Stuff he hasn't posted up yet, as he has been swamped running machines trying to get these done, as well as all the other things that are on the workbenches of the paintball Skunkwerks that is CCM. So, I know what to blow my next paycheck on. Now, the ultimate question: WHEN?!?! Since it will no doubt be asked, maybe you could add if shells are included and how much replacements cost. Should be able to come up with a few more after reading the last several pages of the old thread again.